I’ve been promising myself for a LONG time now that I’ll start a Youtube channel – and now I’ve got a new camera and a week off work I could think of no excuse not to! So not only do I bring you a fabulous little gluten free recipe today, but it comes with a side serving of my first ever vlog! I know a lot of ‘health bloggers’ use dates in pretty much everything but I am actually obsessed with medjool dates! They are so tasty and are basically just like sweets to me – they’re even better cut in half and stuffed with nut butter, yum!! But, I digress, I thought the dates I had would go really well with the banana – which along with the honey adds the sweetness to the muffins. I’m not gonna give you this ‘no sugar’ crap – ok, they may not have any ‘refined’ sugar in them poured from a bag but bananas and honey are as sugary as sugar gets, so don’t kid yourself thinking you can eat hundreds of these and stay lean. I think these strike the perfect balance using natural ingredients and still being a treat! 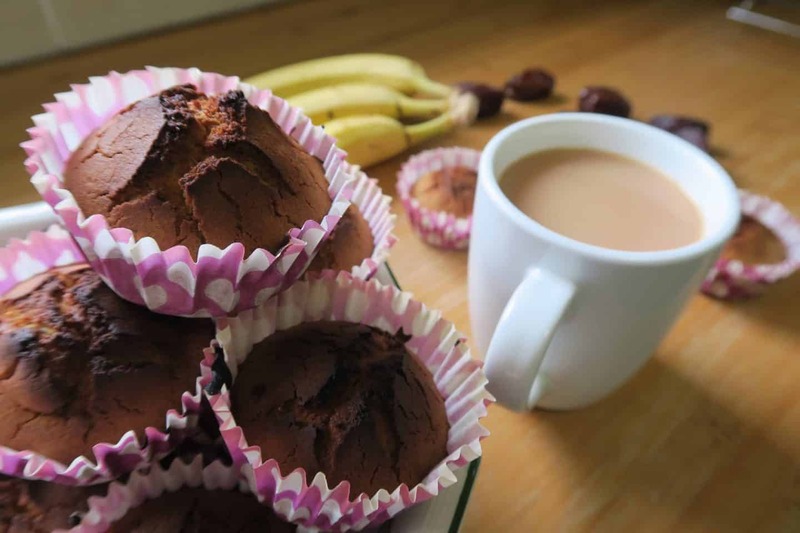 The quinoa flour was really nice to use – it was very smooth and I felt gave the muffins an almost nutty taste. They did give them a slightly grey-ish colour (and my broken oven decided to burn the very tops, grr) but don’t let this put you off, they taste fabulous. This made 18 muffins for me. Macros per muffin: 138 calories, 3.7g fat, 23.5g carbs and 3g protein. Perfect for post-workout goodness! Preheat the oven to 190’C. Find a muffin tin and line it with muffin cases ready. Mix the quinoa flour, baking powder, salt and cinnamon in a large mixing bowl and set aside. Remove the stones from the dates and chop into rough chunks. Add the butter to a small bowl and microwave for 20 seconds or until melted. Add the eggs, honey and almond milk, beat until mixed and then add to the dry mixture. Before doing this, take a pinch of the dry mixture and add to the dates and mix so they are coated lightly. Peel and mash the banana, and add to the mixture along with the dates. Mix well until you have a smooth batter. Fill each muffin case about 2/3 full. Place the tray in the oven for 25 minutes – when done the muffins should spring back when lightly pressed. Cool on a wire tray and enjoy! These can be a little bit sticky but they are so tasty!